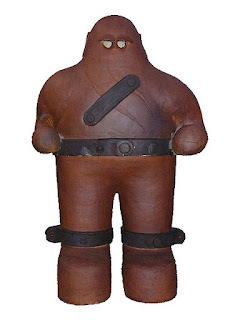 From the Wikipedia 'Golem' page:[a] In Jewish folklore, a golem is an animated anthropomorphic being, created entirely from inanimate matter. The word was used to mean an amorphous, unformed material in Psalms and medieval writing. The most famous golem narrative involves Judah Loew ben Bezalel, the late 16th century chief rabbi of Prague, also known as the Maharal, who reportedly created a golem to defend the Prague ghetto from antisemitic attacks and pogroms. Depending on the version of the legend, the Jews in Prague were to be either expelled or killed under the rule of Rudolf II, the Holy Roman Emperor. To protect the Jewish community, the rabbi constructed the Golem out of clay from the banks of the Vltava river, and brought it to life through rituals and Hebrew incantations. As this golem grew, it became increasingly violent, killing gentiles and spreading fear. Some versions have the golem eventually turning on its creator or attacking other Jews. The Emperor begged Rabbi Loew to destroy the Golem, promising to stop the persecution of the Jews. To deactivate the Golem, the rabbi rubbed out the first letter of the word "emet" (truth or reality) from the creature's forehead leaving the Hebrew word "met", meaning dead. The Golem's body was stored in the attic genizah of the Old New Synagogue, where it would be restored to life again if needed. According to legend, the body of Rabbi Loew's Golem still lies in the synagogue's attic. In part 9 of the analysis of Peter Webber's 2007 film, Hannibal Rising (on this blog), it is explained that the young Hannibal Lecter is, metaphorically speaking, like a golem. a. Wikipedia, 'Golem'. Web, n.d. URL = https://en.wikipedia.org/wiki/Golem.